I had started reading Block’s Scudder books way back in 2011 and when I finally got to the fifth installment – Eight Million Ways to Die – I knew I had just read a game changer for the series. In his foreword, Block says that in the original novel, he was trying to tell three stories: the overarching case involving the disappearance of Kim, the hopelessness of life in New York where death lurks around every corner, and finally Scudder’s struggle to stay sober. He managed to blend all three together seamlessly to craft the first truly “great” book in the series. IDW received praise for its work in publishing Darwyn Cooke’s Parker passion project – his series of adaptations of Richard Stark’s tough-guy noirs from the 60s – so it’s not surprising they would again wish to walk down that dark alley and showcase another hard-boiled story. For Eight Million Ways to Die, John K. Snyder III (Grendel, Suicide Squad) is a one man show in adapting Block’s critically acclaimed novel to the comics format. And the results are tremendous. I think Snyder really nailed the look of 1980s New York – a point in history where The Big Apple was at its most rotten. He paints the landscape in dark colors with rough edges and heavy shading. It all feels very murky and nihilistic – perfect for a story where the main character is nearly devoid of hope for humanity. It was neat to see Snyder’s versions of characters I’ve imagined over the course of nearly twenty novels. Scudder himself looked to be about how I’d picture him; same goes for Danny Boy Bell. I’d love for Snyder to adapt another Scudder novel just so I can see his vision of Mick Ballou come to life. 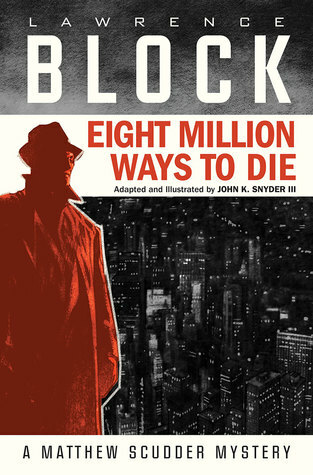 This version of Eight Million Ways To Die is easily one of my favorite graphic novel adaptations and I’d hold it up next to the aforementioned Parker series as examples of how to properly transfer mystery novels to comics – especially one as dialogue heavy as Block’s story. Check out my review of the original novel. Check out the book trailer for Eight Million Ways to Die.